The women’s water polo lost to the Pomona-Pitzer Sagehens 15-5, Saturday at the La Verne Aquatic Center. The first five minutes Pomona-Pitzer scored three goals, leaving the Leopards behind. 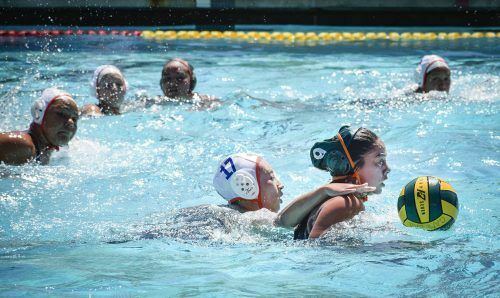 Soon after an exclusion from Pomona-Pitzer, La Verne junior driver Victoria Mezack scored a goal, assisted by junior attacker Yuri Ujifusa, to bring the score to 3-1. “We expected them to play aggressive and we were prepared for it,” senior center Jasmine Bustamante said. The Leopards went into halftime trailing, 9-3. In the beginning of the second half, Leopards had several opportunities to make a goal but could not break through. With only 50 seconds left in the third period, junior attacker Emily Mena caught the ball and shot for the goalie, but the ball hit the post and the Leopards missed the shot. The Sagehens tried to go for another shot but sophomore goalie Shelby Garcia saved the ball and the Leopards fought back. “I think it’s really important for the goalies to concentrate on repeating different types of shots,” Garcia said. With no goals from the Leopards in the third quarter, the Sagehens were able to increase their lead to 12-3. In the first two minutes of the fourth quarter, the Leopards fought back and junior utility Kate Bradley found the back of the net to make it 12-4. After another goal by Sagehens the Leopards received a penalty from an exclusion and Kezman grabbed the ball to score, making it 13-5. “We need to work on movement mobility during the game and communicating more with each other,” said Garcia. La Verne took advantage of several exclusions but could not score. The Sagehens finished the game with two more goals and ending the game, 15-5. Head coach Pat Beemer said that Bustamante played a tough battle against Sagehens. “We put her in a position where she’s getting tackled by the defense and she goes right back in and goes for more,” Beemer said. The Leopards wrapped up the season with a loss to Cal Lutheran, 11-6, Wednesday at the La Verne Aquatic Center. La Verne finished the season 8-16 overall and 5-9 in the Southern California Intercollegiate Athletic Conference. Vanessa Martinez can be reached at vanessa.martinez4@laverne.edu.